Amosta has launched a keyboard with a built-in computer. Called the EZEE PC, the device can be connected to any monitor to make it work. The device comes with Windows 10 and is powered by a Baytrail-CR 3735F quad-core processor with 2GB of RAM. It offers 32GB of storage that can be expanded by up to 64GB via a microSD card. The Amosta EZEE PC features Wi-Fi, Bluetooth and LAN and comes with 2 two USB ports, a VGA port, a 3.5mm audio jack, DC jack, and a HDMI port. The keyboard also comes with a touchpad. Amosta, the brand that has global ambitions of make in India brand, has announced the launch of EZEE PC, initiating what it calls a “breakthrough in the field of mobile computing”. 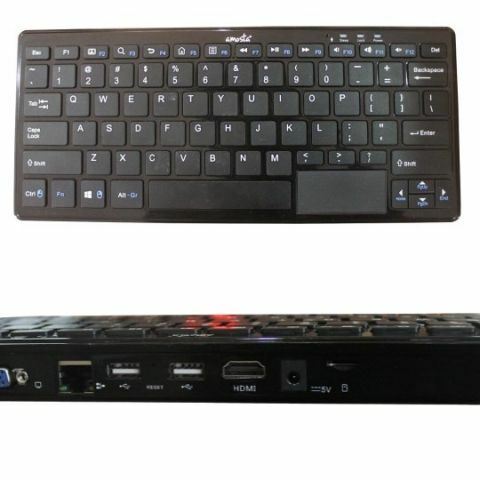 Amosta an Indian startup that is trying to enable an ecosystem dealing in everything from IoT devices to high-end computers and smartphones launches a PC for Mobile Computing, EZEE PC is a keyboard unit with in-built computer. It can be connected with any monitor to make it an operational PC. Available in shades like white and black, it can be used as complete computer unit in organizations and corporates where you can just connect your monitor at work or office. This Windows 10 Licensed PC can be used as complete computer unit in organizations and corporates with Intel Bay Trail. Available in 2GB RAM and 32 GB Flash that is expandable up-to 64GB. It is easy of use, light weight and easy to carry in your bag. It has lesser space requirement with no separate CPU Box. Available with Baytrail-CR 3735F Quad-core processor, It works with Wi-Fi, Bluetooth, LAN – 100 Mb and Ports: 2 USB, VGA, 3.5 mm Audio jack, DC jack, HDMI. With ultra-smooth Touch pad this keypad has full size 76 Keys this is a keyboard made to make the work easy. Keep One Monitor at your workplace and one at home where you can just carry this laptop and connect it anywhere and anytime. You can also keep Ezee PC in bag and use it as a thin client where all the storage can be on cloud. Can you recommend a good gaming pc built under 70k?